One Million Words of Terror It began with Clan Novel: Toreador... 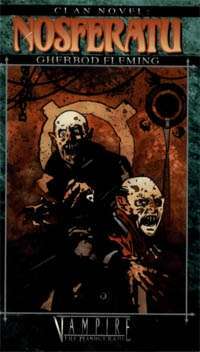 This book, Clan Novel: Nosferatu, is the amazing conclusion of a 13-book series concerning the Kindred-the hugest event ever in the World of Darkness. From small details to grand spectacles, this epic series of over one million words reveals the secrets of this hidden world through the eyes of individuals on both sides of a great conflict. The continued existence of all Kindred, from the youngest neonate to the eldest Methusaleh, hangs in the balance. Revelation Without Comprehension The Nosferatu Calebros has spent an undying lifetime in his subterranean grotto, piecing together scraps of Kindred lore. Naturally, his clan turns to him to solve the mysterious death of a Nosferatu leader, Petrodon. But Calebros reveals an even deeper mystery behind the murder-and the murderer. The search for the truth takes the Nosferatu deep beneath New York City where something unknown and perhaps unknowable awaits. This title was added to our catalog on March 23, 2007.